Calculating the thermodynamics of polarized fermions (realized in nature as nuclei, cold atoms, and neutron matter) is one of the most challenging problems in quantum physics. It suffers from a pervasive issue called the sign problem, which makes probabilities complex and has prevented Monte Carlo calculations for decades. 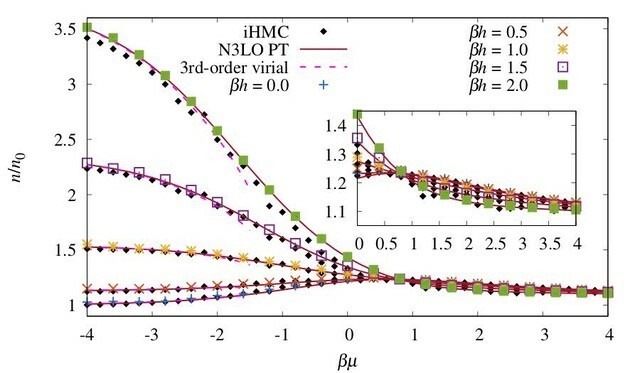 In a recent paper , UNC graduate student Andrew Loheac and his advisor Prof. Joaquín Drut continue the work they started in a previous project  (now in collaboration with Jens Braun from TU Darmstadt in Germany) by carrying out the first exploration of the thermal properties of polarized fermions in one spatial dimension using a complex version of Monte Carlo known as complex Langevin (CL). The successful comparison of the CL results with a variety of other methods (such as perturbation theory and the virial expansion) pave the way for realistic systems in higher dimensions, which are already underway (see e.g. ). A. C. Loheac, J. E. Drut, J. Braun, Phys. Rev. D 98, 054507 (2018). A. C. Loheac, J. E. Drut, Phys. Rev. D 95, 094502 (2017). L. Rammelmueller, A. C. Loheac, J. E. Drut, J. Braun, arXiv:1807.04664.